A Continual Feast: CA Trip, Days 2 & 3: Swallows and Amazons Forever! CA Trip, Days 2 & 3: Swallows and Amazons Forever! Beginning when I was 8 or 9 years old, we had an annual tradition of going up to Fallen Leaf Lake, a small lake near Lake Tahoe, every summer. We camped there each summer with four other families of friends. The tradition, started by the Miller family, required that families participating read the book Swallows and Amazons by Arthur Ransome. This book, and the others in the series, relate the adventures if English school children living between the two world wars and enjoying their summer holidays by sailing about in their dinghies: the Swallow, belonging to the Walker children, and the Amazon, belonging to the Blackett girls. The children are highly imaginative in their adventures as sailors, explorers, pirates, and the like. Having read the books, we took on names of characters for ourselves, named landmarks at Fallen Leaf after those in the series of books, and shared in the adventures of the children we knew and loved as we crewed our own little boats each summer. We enjoyed days of canoeing, sailing, swimming and hiking, evenings of campfires and card games, and nights of warding off the cold night air in sleeping bags spread out on tents, whispering and giggling in the darkness with friends until exhaustion overcame the hard ground and we pulled our sleeping bags over our heads and slept. The drive up to the lake was picturesque. And the lake itself? Just as I remembered it. Well, almost just as I remembered it. I remembered that rock being a lot bigger and a lot farther away from the shore. I guess age brings a change in perspective. 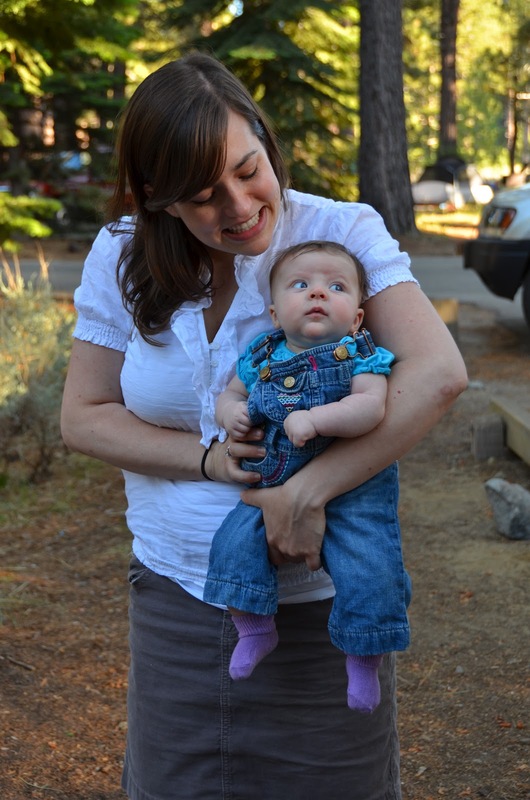 Nell was the littlest camper. There were quite a few other cute little campers, too. And grown-up campers to supervise and have some fun of their own. The first night up at the lake, Nell and I didn't exactly camp. We stayed at a nearby lodge with my parents, who had booked a room with three full-sized beds in it. Nell was pretty worn out from the day's activities. The next morning she was ready to take on the day, starting by playing with Grandpa. We joined everyone back at the camp sites, where we enjoyed breakfast before heading over the hill to the lake again. My childhood best friend, Becky, got to hold my baby. So special. Becky had presents for Nell, too! 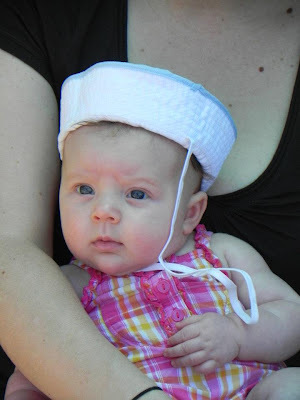 Including the cutest sailor hat you ever did see. The perfect size for the littlest of the Swallows and Amazons, and especially fitting because Becky and I used to have sailor hats we wore back in those childhood summer days. We wore those matching hats of ours until they were worn and grimy despite numerous washings. I still have mine stored away in a box somewhere. Maybe someday Nell will grow into it and want a sailor hat that will never be quite white again. In the meantime, this one is just perfect. 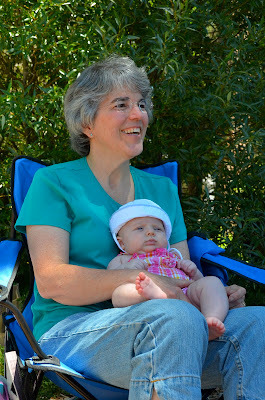 The little sailor girl liked relaxing on Grandma's lap. 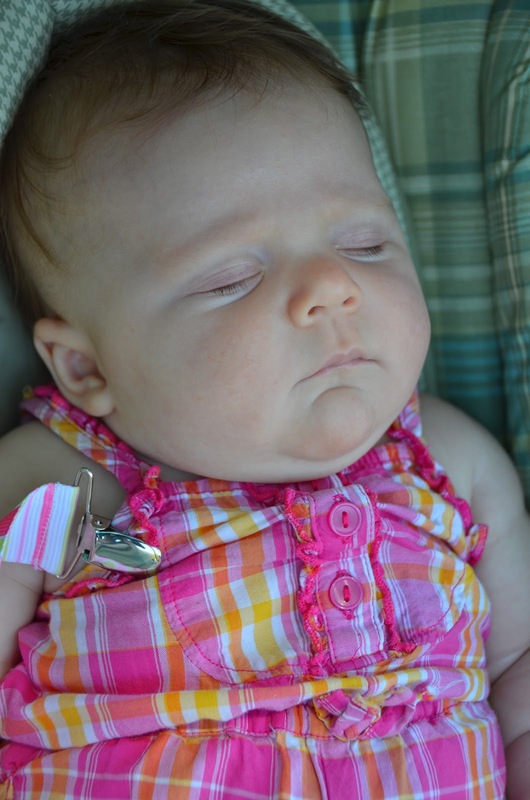 And she snoozed in her car seat some, too. There was lots of water fun to be had. Then it was back to the campsites for the evening. And integral part of any camping experience. And I decided I wasn't quite ready to head back to my parents' house with them yet. So Nell and I stayed for a second, unplanned night, thanks to the generosity of a sleeping bag from Jonathan and Jenn and the back of a van provided by Emily and Gabe. Perhaps that doesn't count as truly camping, but I'm considering it Nell's first camping experience. I hope there are more to come! By the light of Coleman lanterns, we played speed card games. 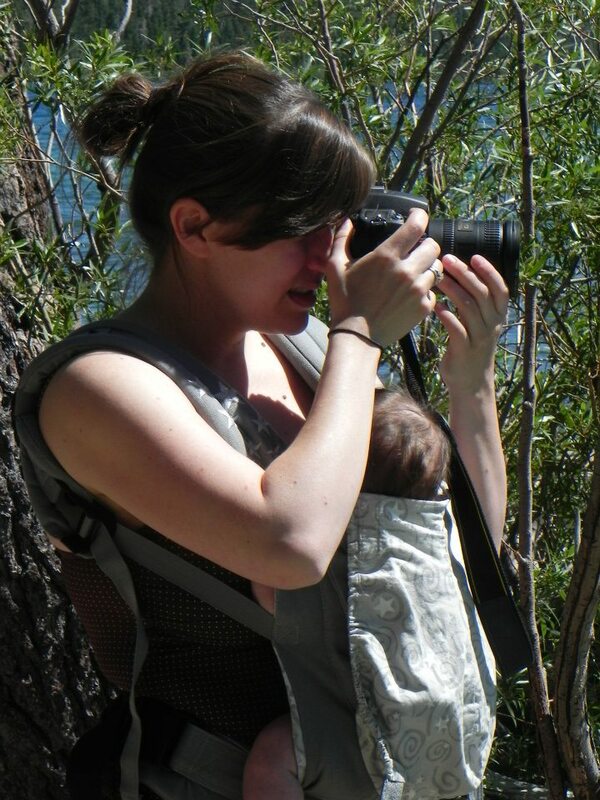 I played too, with Nell snuggled in the Ergo. She put me at a bit of a disadvantage in rapidly reaching and diving across the picnic table to lay my cards down, so Becky and I had to cheat be extra resourceful. A good time was had by all. In the morning, I was sleepy and apparently, a bit the worse for a night spent on the hard floor of a van, with several feedings interspersed throughout the night. But Nell was ready to take on the day! And gazed in wonder at the trees. 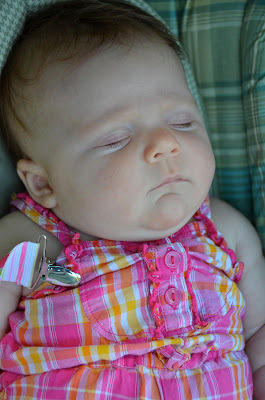 Yes, my girl loved having so many new things and people to see. Her bright eyes were wide with amazement and curiosity on this trip -- anytime they weren't shut in exhaustion. Late that morning Nell and I hitched a ride with Jonathan and Jenn back down the hill to Nevada City. We got back in time for a shower (for me) and a bath (for Nell) and even a nap (for both of us) before a delicious family dinner, and the big event of Day 4 of the trip... Nell meeting the extended family! Pictures to come in the next post. Way fun photos, Sarah! There were 22 little ones.